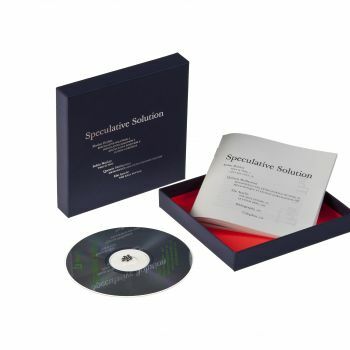 Editions Mego and Urbanomic are pleased to announce the release of ‘Speculative Solution’, a CD and book with contributions by Florian Hecker, Elie Ayache, Robin Mackay and Quentin Meillassoux. Originally commissioned by Urbanomic and developed over the last year, this collaborative project brings together Hecker’s sonic practice and psychoacoustic experimentation with philosopher Quentin Meillassoux’s concept of ‘hyperchaos’ – the absolute contingency of the laws of nature. In an apparent departure from Hecker’s previous release ‘Acid in the Style of David Tudor’ (eMEGO 094, 2009), the four titles featured in ‘Speculative Solution’ contain a series of micro-chronics and sequences of auditory contingencies, ranging from extreme stasis to the most dynamic intensities, crisp dramatisations of what Meillassoux calls in his text ‘extro-science worlds'. As Mackay states in his contribution to the book, Hecker’s composition “participates in a circuit in which it, the accompanying texts, and diverse other objects, enter into a perpetual catalysis that must annihilate all priority, representation, reference, and even entity.’. Both ‘scripture and prescription’, ‘Speculative Solution’ invites its users to integrate its sonic and textual components, as they enter into an accelerative cycle, becoming “truly ‘literalist’ marks which have no reason to be as they are, and which could have been – and still could be, at every moment – otherwise”. With ‘Speculative Solution’ Hecker proposes that the concepts of absolute contingency and hyperchaos offer a rigorous new alternative to the employment of chance and randomness in avant-garde composition. It is recommended to listen to ‘Speculative Solution’ on loudspeakers at high volume. Headphone use is not advised. Frequent recitation of the included texts is also indicated. ‘Speculative Solution’, is Hecker’s 13th release with (Editions) Mego. It comes in an embossed, deluxe box with a bilingual (English / French) 160 page book and 5 metal balls (ø 3,969mm). Available only in this format.